Since this information was first posted November 2010, a few things have changed. My book is no longer “upcoming.” It’s available for purchase on this very website! Primatene Mist is no longer available OTC, though it may be again someday. The manufacturer is still hopeful that a new version with an environmentally-friendly propellant will be approved. For a few years, Asthmanefrin was widely available as a potential replacement. However, FDA concerns over drug and device safety resulted in a recall of the product. Primatene Tablets remain on the market. Though likely less effective than Primatene Mist, and still with a significant likelihood of systemic reactions (increased heart rate or blood pressure, or nervousness or jitteriness), the tablets are probably your best bet for OTC asthma prepping. The remainder of the article remains current. Part one of this series (Asthma and COPD – Part I – Introduction) discussed the different types of asthma, avoiding triggers, and home monitoring. 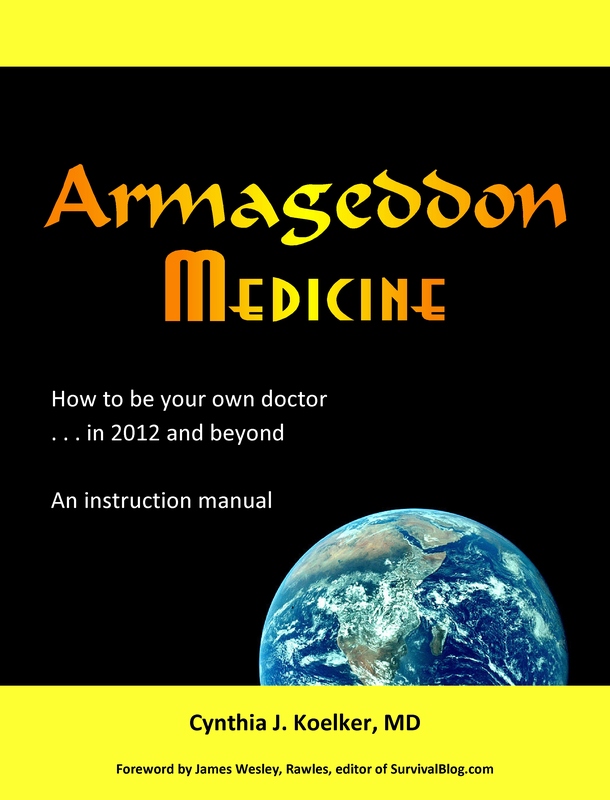 Today’s post, excerpted from my upcoming book, Armageddon Medicine, discusses over-the-counter treatments that may be useful for asthmatics, and are available for stockpiling now. Caffeine is the most universally-available chemical to open the airways. A review of the medical literature by the Cochrane collaboration concluded that the ingestion of caffeine offers modest improvement in lung function for 2 to 4 hours after consumption (a 12-18% increase in FEV1). Doses as low as 5 mg/kg body weight were shown to have an effect. For a 70 kg (152 pound) man, that’s 350 mg of caffeine, or about 2 strong cups of coffee or black tea. Caffeine is also available as 200 mg tablets, generally sold to promote wakefulness. It’s amazing that Primatene Mist (epinephrine) is available over-the-counter. Epinephrine used to be a mainstay of asthma treatment. It is certainly effective, but quite likely to cause rapid heart rate and jitteriness. It is the same as adrenaline, which causes the rush that you feel when someone jumps out of a dark corner and scares you. Doctors advise patients against the use of this medication, not so much because it is ineffective, but because of side-effect concerns including rapid heart rate, increased blood pressure, and nervousness. Another drawback is the short-acting nature of the drug, lasting only a few hours. Unless the medication is released in a new formulation, it will be withdrawn from the market as of December 31, 2011. Primatene Tablets containing ephedrine are currently available over the counter. Related to pseudoephedrine, ephedrine behaves similarly, with a somewhat greater risk of the same side-effects. Pseudoephedrine is one of my favorite medications. It decongests the airways from top to bottom, alleviating symptoms of sinus pressure, ear pressure, nasal congestion, and lung congestion. Although patients now have to sign for the medication (thanks to the methamphetamine labs), it is an excellent drug to stock up on. Common side-effects include insomnia, anxiety, and rapid heart rate or palpitations. Some patients find it too drying, although this effect is dose-related. A few patients have the paradoxical side-effect of drowsiness. Antihistamines help dry up secretions and minimize the body’s reaction to substances to which a person may be allergic. If you suffer from mucus accumulation (phlegm) as part of your obstructive lung disease, you may find an antihistamine helpful. Note: some patients have the opposite reaction, and find the thicker, drier mucus more difficult to expel. These patients may do well with an expectorant (guaifenesin or SSKI). Patients with allergic asthma do particularly well with antihistamines. The over-the-counter products are essentially as good as prescription medications. Benadryl (diphenhydramine), Claritin (loratadine), Zyrtec (cetirizine), and chlorpheniramine are all available OTC in inexpensive generic form. Claritin and Zyrtec are less sedating than Benadryl or chlorpheniramine. Some patients have the opposite effect and feel ‘wired’ when using an antihistamine. NasalCrom is a nasal inhaler for nasal allergies. It contains cromolyn sodium, one type of controller medication useful in alleviating chronic asthma. When originally released, it was available only by prescription. (The lung inhaler and eye drop remain by prescription only.) Although NasalCrom is intended for nasal allergies and is inhaled through the nose, some of the medication reaches the lungs. Used on a daily basis, and inhaling deeply as the mist is sprayed, NasalCrom may decrease the overall severity of chronic asthma symptoms. Other advantages are the cost (less than $20 for a bottle containing 200 sprays) and excellent safety profile, even at the high end of dosing. This medication will not cause jitteriness, rapid heart rate, drowsiness, nor insomnia. This entry was posted in Allergic, Asthma, Asthma/COPD, Benadryl - diphenhydramine, Caffeine, chlorpheniramine, Chronic bronchitis, Claritin - loratadine, COPD, Herbal and complementary, Herbal medicine, Lung disease, Medical archives, Mild, OTC Antihistamines, OTC Decongestants, OTC inhalers, Primatene mist, Sudafed-PE - phenylephrine, Sudafed-pseudoephedrine, Vicks, Zyrtec - cetirizine and tagged Allergy, Asthma, Benadryl, Caffeine, Cetirizine, COPD, Cromolyn, Loratadine, Prescription drug, Rhinitis. Bookmark the permalink. Missed stocking up on Primatene Mist but would Asthmanefrin work the same? I have allergies to bee stings and stockpiling EpiPens is not an option. Fantastic site, also it seems like you have a ton more visitors as well, since the last time I was here. Ciao! I have bookmarked this and also am looking forward to reading new articles. I just bought a Primatene Mist inhaler for my first aid kit since Epi-pens are harder to obtain. The package indicated the product will not be available after 12-31-2011 not 2010. Just thought you’d want to know. Thanks. I enjoy your blog! Just fyi. In Oregon, you must have a doctor’s prescription for pseudoephedrine. I just head up to Washington to get the medication when I need it. The USFS issued epinephrine inhalers in their fire crew EMT first aid kits in the 1990’s for use in Anaphylactic shock. I have not read the studies but it makes sense that epinephrine applied directly to affected airway tissues will have both a local and systemic affect. I understand this is an article concerning asthma. However, knowing that my Epi-Pen contains epinephrine and that I will likely die without it if I were stung by a wasp, my curiosity is piqued. Can an OTC like Primitine Mist help me with my allergy? Can you write a post soon addressing the concerns of someone with an allergy like mine? Hives die down I assume but airways swollen shut just kill. Any help would be very much appreciated. I have never used Primatene Mist for a serious allergy (anaphylaxis), but I believe it would be effective. After December 31, 2010 it will no longer be sold, so you may want to stock up now. Prescription rescue inhalers work similarly (albuterol, Proventil, Ventolin, Alupent). The reason we use inhalers for asthma (instead of pills) is to avoid the side effects such as rapid heart rate and elevated blood pressure, which you’ve probably experienced if you’ve ever used your Epi-Pen. If I were to use Primatene for an acute reaction, I would also use an antihistamine such as Benadryl. Repeating the dose in 3 to 6 hours may also be necessary. Certainly if the choice is dying or using Primatene, I would keep the Primatene handy. Taking an antihistamine before probably exposure (such as working outside) might also lessen an allergic response. In 1983 I almost died from an anaphylactic reaction to eating a bite of jello with mayonnaise in it. I used my Primatine mist inhaler like crazy and took about 3 or 4 Triminic allergy pills. It bought me some time before my reaction became life threatening. I amazed the doctor with my quick action. Is there a place in our preppers medical supplies for some Primatene Mist (epinephrine)? Would this be an option for treating an allergic reaction if you don’t have an EpiPen for example?